Bavaria’s 12.5 million inhabitants, living in an area roughly the size of South Carolina, are culturally divided between the North and South. This is clearly evidenced through the different language patterns and dialects, conservative versus liberal attitudes and, of course, cuisine! were first baked in the city of Nuremberg, with the earliest records dating to the year 1395. During the Middle Ages, spice inspectors at the gates to the city checked the spices used for baking the gingerbreads which traveled to places as far away as China. In 1643 the city of Nuremburg approved the first Lebkuchen Baker’s Guild which began with 14 master gingerbread bakers who were bound by strict regulations. 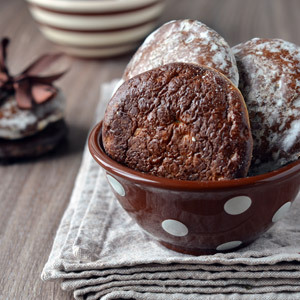 Until 1867, Lebkuchen were made by hand. Automated processing started thereafter with the liberalization of Bavaria’s commercial trade. However, many of Nuremburg’s bakeries still produce some of their Lebkuchen specialties by hand, using traditional recipes passed down from generation to generation. The oldest gingerbread recipe, dating from the 16th century, is housed in the German National Museum in Munich. In 1996, Nuremburg gingerbread was declared a “protected geographical indication” and is authorized to use the EU stamp. The main ingredients of Lebkuchen are: honey, flour, sugar, eggs, hazelnuts, walnuts, almonds, candied orange and lemon peel, marzipan, spices (cinnamon, ginger, aniseed, cloves, pimento, coriander, cardamom). Today, the city hosts Germany’s major gingerbread exporters, like Lebkuchen Schmidt, Burg-Lebkuchen, Haeberlein-Metzger, Weiss Lebkuchen, Ifri-Schuhmann-Lebkuchen, Wicklein-Lebkuchen and Wolff Lebkuchen. Fränkische Bratwurst (Franconian sausage) is a popular sausage of North Bavaria. The sausage is typically roasted, prepared as so-called Blaue Zipfel (boiled in vinegar with onions) or smoked. The sausage is about six inches long. A traditional Fränkische Bratwurst is served with Sauerkraut and German potato salad. But it is also very tasty with freshly baked farmhouse bread, horseradish and a cold beer. Coburger Bratwurst, available in the beautiful medieval town of Coburg, consists of a combination of pork and a minimum of 15 percent beef. This sausage is bigger, at about ten inches long. Nürnberger Rostbratwurst (Nuremberg sausage), in contrast, are small sausages, coarsely chopped up and grilled. 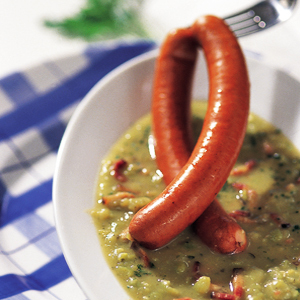 Quantities of 6, 9 or 12 sausages are frequently served, together with sauerkraut or green cabbage and a pretzel. Another way of eating them is three small sausages served together with mustard in a roll. Nürnberger Rostbratwurst is finer and smaller than the usual German Bratwurst, only about 3 inches in length and a little over half an inch in diameter. One story says the diameter of Nuremberg Rostbratwurst is so small because years ago the sausage was used to feed prisoners of the Nuremberg prison Lochgefängnis. Relatives of the prisoners, reportedly, passed the sausages through the cell keyhole! 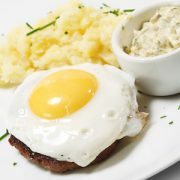 Schnitzel, a word common in America but often misunderstood, is a thin, tenderized meat that is breaded and then fried. In Bavaria, schnitzel is made either from pork or veal and served in a variety of ways, from Wiener Art (breaded with lemon) to Jäger Art (with mushrooms and peppers). It is a classic dish that is both filling and delicious! Weißwurst are white sausage made from finely minced veal and pork bacon. Traditionally, this sausage was consumed only before noon time and washed down with a Weißbier, the light and tasty Bavarian wheat beer! Today, Weißwürste and Weißbiere can be ordered at any time of the day (or night) thankfully! One typical Bavarian food is a camembert cheese spread called “Obatzda,” made from camembert mixed with other cheeses, onions and spices. Obatzda is usually served with rye bread or pretzels, and makes a great spread at BBQs and gatherings to watch Fußball! 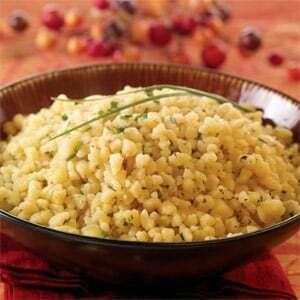 Spätzle literally translated means “little sparrows” in the Southern Bavarian dialect. This well-known dish consists of tiny noodles or dumplings made of flour, eggs, water or milk, salt and occasionally nutmeg. In Bavaria, Spätzle and chanterelles is a frequent side dish to fall game entrees such as deer, rabbit and boar, all of which are popular in the more rural Bavaria. Spätzle is a filling dish, and as such it does not taking a huge serving size to fill someone up, especially when paired with a good Bavarian bier! Beer is Bavaria’s most well known (and popular) product. In 2014, the per capita consumption of beer in Germany averaged 104.7 liters. Almost half of Germany’s breweries are located in the Free State, which is an old term for the region of Bavaria. 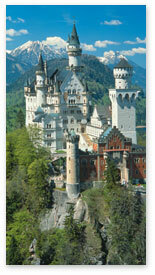 In 2006, Bavaria listed 618 breweries. 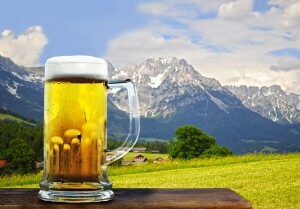 Famous Bavarian beers imported to the USA and Canada are Ayinger, Hofbräu, Franziskaner, Schneider, Löwenbräu, Hacker Pschorr, Weihenstephan, Tucher, Paulaner and others. (Read more about these Bavarian beers in our articel on Oktoberfest Beer.) Bavaria loves beer production so much, that the town of Aufseß, located in the Franconia region of Bavaria, has the highest brewery density in the world. The town boasts four breweries with a total population of only 1,352 people, which is one brewery for every 338 people! 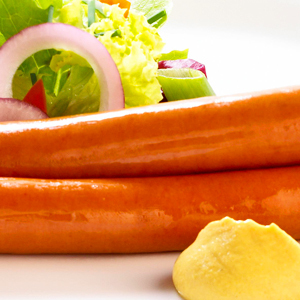 Probably the longest sausage of Northern Bavaria is the Mainfränkische Meterbratwurst. As the name implies, the sausage is one entire meter long (about 40 inches)! The Mainfränkische Meterbratwurst is slim, only 1/3 to 2/3 of an inch thick. Most people cannot manage to down a whole one, so the sausage is frequently offered as half a meter. But those who are very hungry should definitely go for the longer version, as it is a challenge worth overcoming! After all, more is better in this case! The South of Bavaria hosts one of world’s most famous castles, Schloss Neuschwanstein, the fairy-tale castle of former King Ludwig II attracts annually more than 1.3 million people and was immortalized by Walt Disney as the castle used in “Cinderella.” Close to the castle are five lakes and, further to the West, the pastoral region of the Allgäu, known for its dairy farms and a wide variety of cheeses and cheesemakers. One of them, the Käserei Champignon in Heising, is a family owned business with almost 100 years of cheese making experience. Cheeses such as Cambozola, Limburger or Champignon Mushroom are all available in the USA and Canada. Alpenhain, a specialist in the production of Camembert and Brie, is to be found in Lehen/Pfaffing, an hour away to the east of Munich. The firm’s name derives from the family name “Hain”, and the fact that the business operation started in the upper foothills of the Bavarian Alps in 1905. Alpenhain is the market leader in the production of crispy breadcrumb coated cheese in chilled and frozen formats to the catering, wholesale, manufacturing and retail trade European-wide. Alpenhain also produces a range of cheese with Bavarian regional characteristics for the same markets. The Bergader Privatkäserei is also situated in Upper Bavaria to the east of Munich. The company exports its famous Bavaria Blu (soft cheese), Bergader Edelpilz Brick (blue-veined cheese), Bianco Natur Brick (creamy and mild alpine cheese) and Basil’s smoked cheese (hard cheese with a note of smokiness) to the USA and Canada. On average, each German citizen consumes 775oz cheese per year, and a good deal of it is produced in Bavaria. 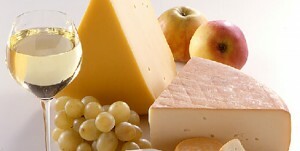 The Free State of Bavaria offers more than 400 different kinds of cheese with more than 1000 flavors. Other Bavarian cheese brands available in the US and Canada include Allgäuland, Bauer, Chiemgauer, Innstolz, and Schoenegger. Munich – It’s not all about the Oktoberfest! Visitors to Munich can get a feel for Munich’s breadth of pallet-pleasing delicatessens at a famous destination for gourmets: Dallmayr, a large delicatessen store, near Marienplatz in the heart of Munich. Dallmayr is known throughout the world, especially for its coffee brand Dallmayr Prodomo, is a family owned company that is in existence for more than three centuries. Several times a day they offer freshly roasted coffee in the coffee department of the delicatessen. Dallmayr also carries delicious filled chocolates and truffles that you don’t want to miss. If you would like to rest a little from the sightseeing, why not in Dalmayr’s café or restaurant, both of which are part of the parent house? The Hofbräuhaus, visited by locals and tourists from all around the world, is one of Munich’s oldest breweries. Its huge beer hall is known worldwide for its delicious beer, traditional oompah music, Bavarian dishes and Lederhosen (traditional leather trousers), as well as its hefty food offerings!